Living in Germany, one of the best things about the Fall season is Oktoberfest! This annual celebration in Munich begins this weekend and runs until the first weekend in October. And... starting new traditions in Germany with Bavarian themed savory cupcakes is Wir Machen Cupcakes - Munich's best and only cupcake shop. 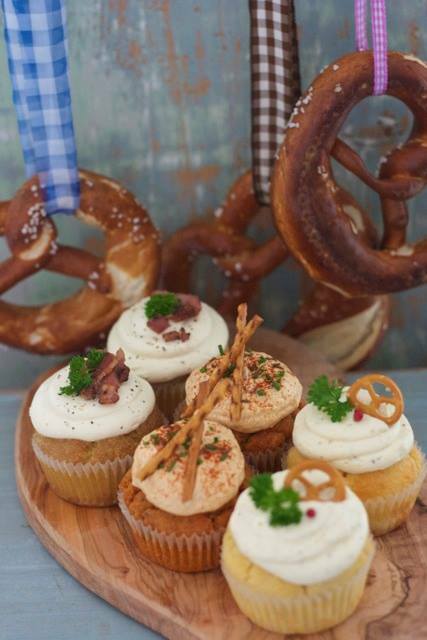 These cupcakes are perfect for Oktoberfest! If you're in Munich for Oktoberfest, make sure you stop by and tell Sheloian & Iris I say HALLO! and taste some of their amazing cupcakes! Macho - Savoury beer cupcake with cream cheese and Oktoberfest brew frosting. Garnished with fresh parley, crispy bacon bits and cracked black pepper. Weißwurst Cupcake - The cupcake answer to a Bavarian tradition! Herbed white sausage cupcake with sweet mustard & cream cheese frosting. Decorated with parsley, pretzel and a pink peppercorn!